Memories, like the… I’ve forgotten the words! Memories take years to consolidate. Yes, years. The hippocampus, so intricately involved in memory creation with the cortex, doesn’t allow the consolidation of memories in the cortex for years. No wonder it is often so difficult to remember things. To stand the best chance of memories making it to long-term storage we need to repeat. Exposure to most memories stand little chance of long-term retention. Unless, that is, they are heavily encoded. Shocks, traumas and delightful experiences make it to long-term storage because the emotional attachment to the memory is so strong. One experience is often all it takes. In the case of painful experiences our desire is that we never experience it again. The memory, however, is deeply encoded in our minds. We can weaken its grip but it’s unlikely it will ever completely fade. What about the every day experiences that we want to remember such as someone’s name, a thing to do or a learning concept or fact? How can we increase the chances of remembering? Repeat. It might be common sense to think repeating will help remember but it’s remarkable how infrequently we do repeat things we want to remember. Not only should we repeat to remember but we should keep repeating. 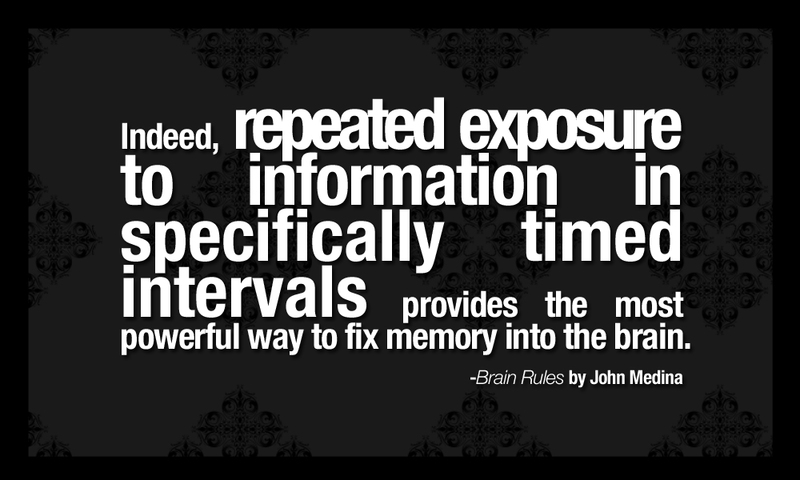 John Medina, he of the brilliant Brain Rules book, suggests that a school day repeating learning every hour or so in the day for a managed amount of time would enhance information retention no end. The challenge becomes avoiding boredom but the brain would thank you for all that repetition. The brain really is pretty poor at remembering things that we want to remember. One exposure is rarely enough to remember anything. To enhance memory retention further, encode the experience or fact that you want to remember with new emotions, feelings and any associations you like. Yes, that actually means that there will be more things to remember! As counter-intuitive as this sounds, this helps memory retention. Repeat – and repeat – and repeat – at regular intervals throughout the day. Encode the memory with as much experience, feeling and association as you can.